The Romulans are here! Is Star Fleet ready? Stock #4102, Retail Price $29.95. To buy a copy now, click here. New Game Value: Sixteen new ships and ten new scenarios.. This product requires Romulan Border or Klingon Border for use . 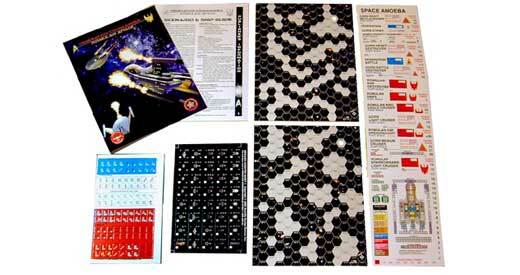 Components:16-page Ship & Scenario guide, 108 half-inch and 40 one-inch full color die cut playing pieces, sixteen full color double-sided laminated ship cards, and two 8.5x11 hard-mounted double-sided map panels (showing asteroid belts). Who will buy it? Veterans of Star Fleet Battles, players of Federation Commander: Romulan Border, fans of Star Trek, and fans of miniatures starship games. Gorn: CS, BCH, HDD, BDD, CM, CL. Armed Priority Transport, Space Amoeba. 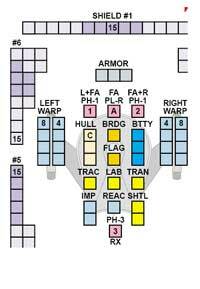 Romulan Space: This product consists of the parts of Romulan Border that are NOT duplicated in Klingon Border. 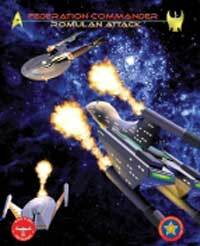 If you bought Klingon Border, and do not want the extra maps or a second rulebook, then Romulan Space (which has only the ship cards, counters, and scenarios from Klingon Border) may be a low-cost alternative for you. 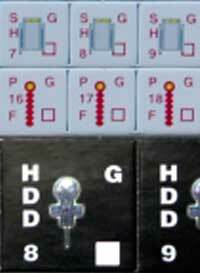 Squadron Boxes #10, #11, and #12 provide one each of the pewter scale miniatures to match the ship cards in this product. Stock #s 4310, 4311, 4312; Retail $34.95. Boosters #10, #11, and #12 provide more of the most used ship cards so you can fly multi-ship squadrons; plus entirely new ship cards. Stock #s 4210, 4211, 4212; Retail $9.95. Border Box #4 provides 24 miniatures to match the ships in Boosters #10, #11, and #12. Stock # 4404; Retail $99.95. To buy any of these products now, click here. Klingon Border or Romulan Border include all required rules for the ships in this product. This product requires one of those products.